Sean O’Loughlin returns to one of his happiest hunting grounds tomorrow night in confident mood. Wigan have won their last six meetings at Hull FC, trailing back to 2010. O’Loughlin also scored the match-winning try for England against New Zealand at the KC Stadium last November, and played in a 2013 World Cup win against Fiji. He admits the venue is one of his favourite as Wigan aim to stretch their 100 per cent start to the Super League campaign. And the 33-year-old feels the Warriors are in a good place following narrow wins against Catalans, Huddersfield and Salford. He said: “The KC is one of the best grounds to go to and play, it’s an impressive stadium. “The England game last year was a highlight and we had a good win there last year for Wigan as well, so we know we’re capable of winning there. “We know we need to sharpen up on the way we’ve been attacking but you expect that at the start. You don’t expect to be smooth and firing on all cylinders. “We feel confident where we’re at. We’ve ground out wins and picked up points at this stage, and it builds your confidence even when you’re not playing particularly well. 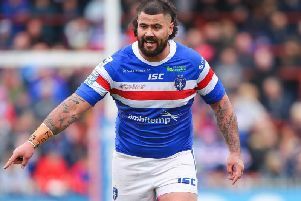 Hull FC have won two of their opening three games and have strengthened in the off-season with the capture of - among others - Kiwi internationals Frank Pritchard and Sika Manu. “They’ve quite a lot of new faces, they’ve come up short in the last few years but they seem a real genuine challenge this year,” said O’Loughlin.